Once the siding is removed, cut marks and paint marks show where trim pieces have been removed from a window. Among the many ways an old house can lose its character, the addition of artificial siding is probably the most typical. Beginning in the 1960s, thousands and thousands of houses in New England were encased in aluminum and later vinyl siding, eradicating the texture and detail they once displayed. The good news is that once the siding is removed, the evidence of how the house was originally intended to be seen is revealed, and the original look can be recaptured. Historic New England recently shared this advice with a Historic Homeowner member wondering about removing siding from their house. Putting vinyl siding on a house is like wearing polyester clothing to stay dry. It doesn’t breathe and even if the exterior is shedding water, the underlying surface exists in a perpetually moist state. If you’ve decided to correct this situation by removing the siding, you’ll want to plan ahead for whatever conditions may exist underneath—whether that is deteriorated clapboards or damaged or missing architectural elements. Usually, when the siding was installed, only the projecting elements were removed. 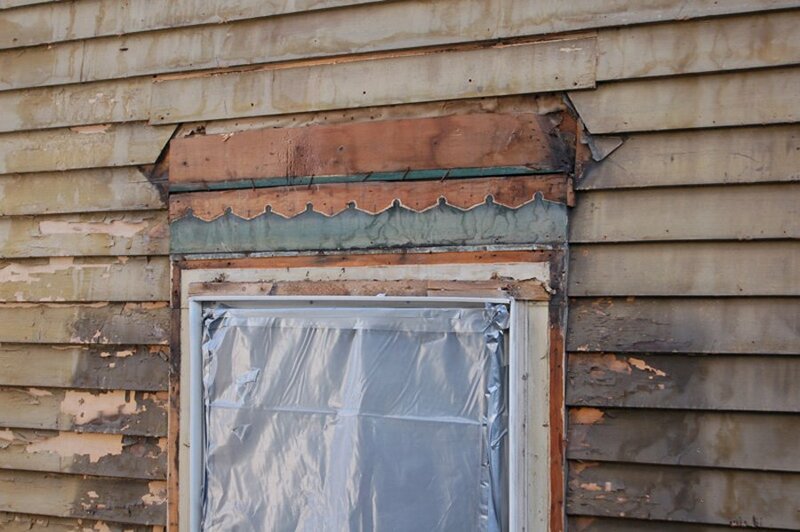 Therefore, the clapboards were kept and cut marks and shadow lines of lost trim will provide a template for restoring the original appearance. Don’t solicit cost estimates for clapboard replacement and trim restoration until you’ve removed the vinyl siding. It’s a straightforward, if messy, job you can do yourself or contract out. Start from the top and work your way down the wall, removing nails carefully to avoid damaging clapboards. You will find a lot of dirt under the siding, as well as a layer of building paper. You’ll also get a good sense of how your house looked before it was sided. Restoring the house’s historic appearance will probably require replacing missing trim and some of the siding. Resist the temptation to strip the siding down to the bare sheathing boards. A good percentage of the underlying clapboards should be salvageable and even dingy clapboards represent higher quality, old-growth, tight-grain wood that can be kept. You’ll need to work with a knowledgeable contractor who’s certified in lead paint abatement to scrape down old paint layers, since pre-1978 houses are likely covered in this now-banned paint. Once the paint has been removed, fill the nail holes with putty, sand, and then wash the house with painter’s detergent and a stiff bristle brush followed by a clear water rinse at low pressure. It’s important to allow the clapboards to return to a normal moisture level, so ideally the project should occur over several seasons, perhaps removing the siding in the spring, restoring the clapboards and trim in the summer, and repainting in the fall. To dispose of the siding, check to see if your local landfill accepts it or visit a vinyl recycling directory for the names of recyclers in your area. Historic New England’s Historic Homeowner membership offers knowledgeable support and customized service that no shelter magazine or how-to guide can provide. Learn more.